A sport’s pennant to show your team spirit – that’s what we’re going to make today! Cut out your pennant flag. It can be as big (or small) as you would like. 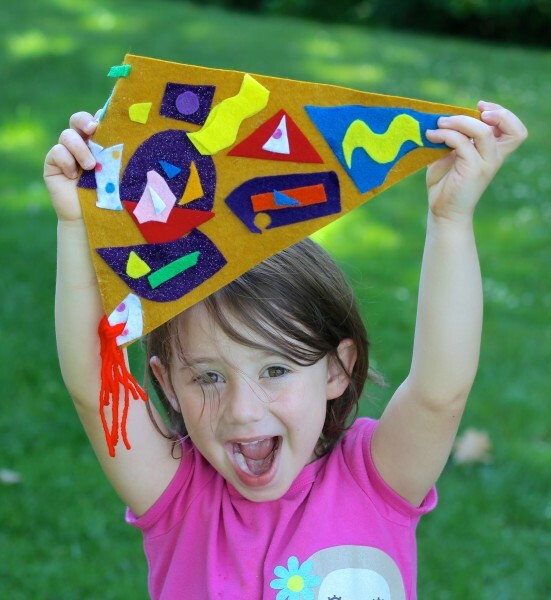 Some pennants are very long triangles – have a grown-up help you cut out the type of triangle you’d like. Cut out pieces of felt to decorate your flag. We chose to use abstract pieces for our team flag, but you can cut out letters if you’re able, or even draw a picture of your team mascot! Glue the pieces down to your main flag. You can layer your felt, create patterns and shapes, or spell out a word! When you are happy with how your pennant looks, go ahead and let it dry for a couple of hours. Attach the tassels to your pennant. Cut a small slit on the two corners along the shortest side of your flag. Make a tassel by cutting several 8-inch pieces of yarn, pull them through the slit, and tie them in a knot. We used 4 pieces of yarn per tassel. Now it’s time to cheer your team on! Run! Jump! Hide! Whatever the sport is that you created, cheer on your fellow teammates to victory! When you’re done, you can hang your flag in your bedroom to remind you of your very own sport from scratch. What do you think Martin and Sylvia’s team pennants would look like? Can you make pennants for their teams? If you don’t have enough felt you could use colored construction paper or draw a picture of what you think they would look like! Are there any other sports teams that you and your family enjoy watching? Can you make a pennant for that team? What colors will it be? What images will you include?